Ghost Upon the Floor: Quoth the raven? Happy Birthday, Edgar. 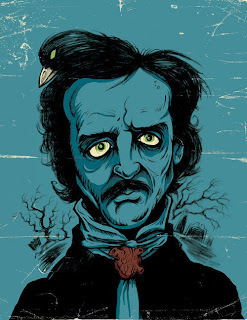 Today marks the day when Edgar Allan Poe turns 201 years old. And it appears that the traditional Poe toaster may have followed Lenore. Once again, the "Poe toaster," the mysterious man dressed in all black but a white scarf who leaves a half empty bottle of cognac at the visionary's grave, did not make an appearance during this morning's early morning hours. The toaster made these nightly appearances yearly from 1949 until last year, as I blogged at the time. Jeff Jerome, curator of the Poe House and Museum in Baltimore, has been quoted as saying "I think he's done." Jerome has been present for Poe toaster watching events since the 1970s. The crowd gathered for last night's no-show included visitors who had made their way from as great distances as France and Russia. The international crowd watched as numerous "faux toasters" attempted to take the place of the traditional visitor, something Jerome stops from happening by keeping certain details of the toasters' visit secret. Makes one wonder as to the value of keeping the tradition going versus preserving the event's purity, and how to keep all the masses from becoming the toaster. I will say that I hope the tradition of the Poe toaster watches continue, if only for the selfish reason that I someday hope to be in Baltimore's graveyard in the middle of the night on January the 19th. Image: user: rainbow532 on Fanpop.com.